Simply put: the goal of this website is to label, categorize and help you guys find where to purchase each and every t-shirt worn by the character Sheldon Cooper in the CBS sitcom, The Big Bang Theory. This list originated on HubPages.com but, due to that sites policy changes (not to mention the ever growing pile of unchecked dead affiliate links I'd accumulated), I eventually bit the bullet and abandoned it. Until now. Hopefully this new home will act as a better, more user-friendly guide for finding the shirts worn by Sheldon. It should also be noted that — contrary to what this pages header claims — I couldn't find every shirt the character wears. And for some shirts — many of the plain striped shirts, dress shirts, and costumes, at least — I didn't even try. With that being said, I have found most and continue to look for those which remain unknown. Since I'm not a retailer, and own none of the t-shirts being sold here, I link to outside websites for the shirts that you can purchase. These online stores often go out of stock, close up shop, or otherwise stop working sometimes. Due to this, you'll undoubtedly come across a broken link on occasion. I'll try to stay on top of the problem as much as possible, but try not to be surprised when occasionally you come across a "Buy this shirt at the link below" and find that "the link below" leads absolutely nowhere. When this happens, either let me know via the comments section or email (check the "Contact" tab above), or just check back here later and hopefully I'll have a new link ready to go. If you're in a hurry, however, just try typing in the shirts title on Google and you may find what you're looking for elsewhere. Speaking of elsewhere! 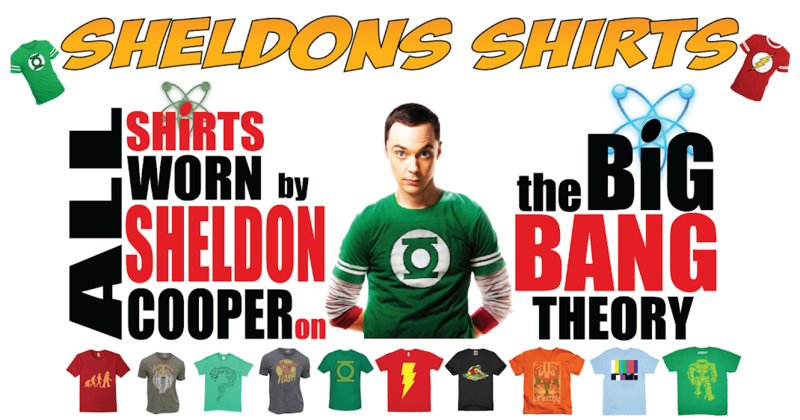 A big, hearty thanks should go out to all the other websites out there who are peddling Sheldon Cooper's shirts. Yeah, I suppose they're technically competitors, but I have no dreams of making riches from this place. And, besides, they were a big help when it came to hunting down some of the harder-to-find tees that Sheldon wore, so I'd be a scumbag if I pretended to not know of their existence. You can find links to each store that I found useful by checking out the tabs at the top of the page. Also, thanks to all of you who have contributed to helping me find some of the trickier "unknown" shirts on this list! I greatly appreciate it. For many tees listed here, I could have never found them without you. Thanks for keeping this place working!